This translucent orange storage brick is available exclusively at Target for $19.99 and is just enough storage to take a small amount of Lego on the go. If you have more than one, they are stack-able. It comes with a yellow child medium shirt inside with various Lego logos on it. Here are images of the enclosed shirt. The large logo on the front is the company's 1955-1959 design. On the back there is a large image of the 1998-Present logo. Dimensions are 7.2" height and 4.92" in diameter. Usable storage is a few elements more than a large Pick-A-Brick cup, which has a capacity of 36.5 ounces of liquid. There is a bit of additional room for larger plates placed vertically in the storage container as there is some unused room in the lid. Utilizing 1x1 round tile elements in my favorite W.W. color, I did some measuring. Filled to the brim, it is still easy to get the lid on the storage brick without spillage being a concern. When moving that amount to the large PAB Cup, you can no longer snap on the lid. The orange storage brick does stack a lot nicer than a PAB cup, though there is much more risk of spillage as the lid does not snap on tightly. One drop means your Lego escapes where you might have a chance if you were to drop your PAB cup. My recommendation, save your twenty bucks unless you really want the shirt. 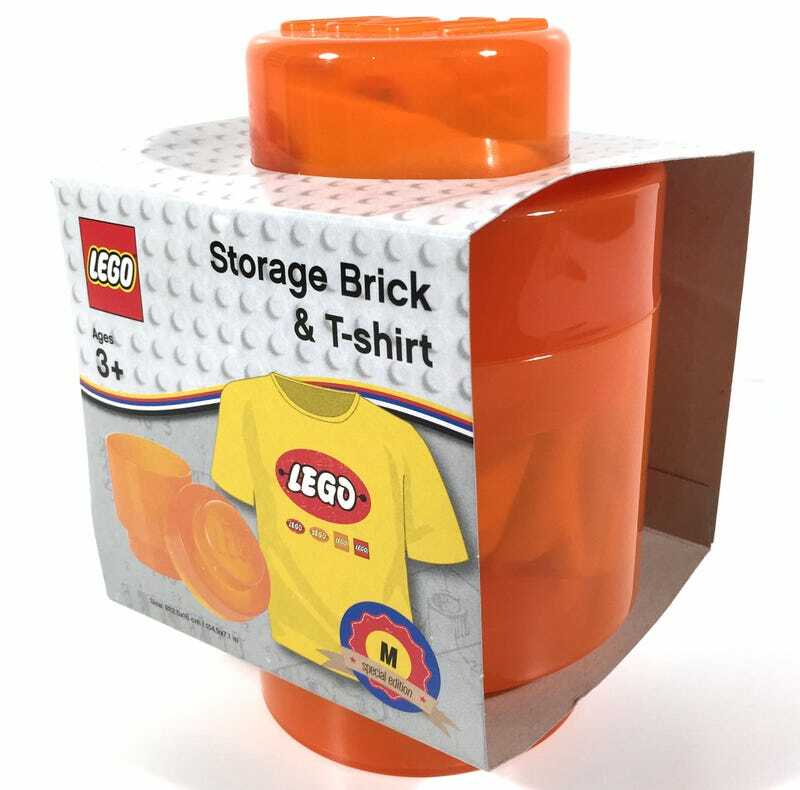 Go to your Lego brand store, spend $15.99 and fill a large PAB cup with actual Lego bricks and have a storage solution that has nearly the volume of this storage brick.